Bought this to go with my Vigo vessel sink. Works great and was easy to install. 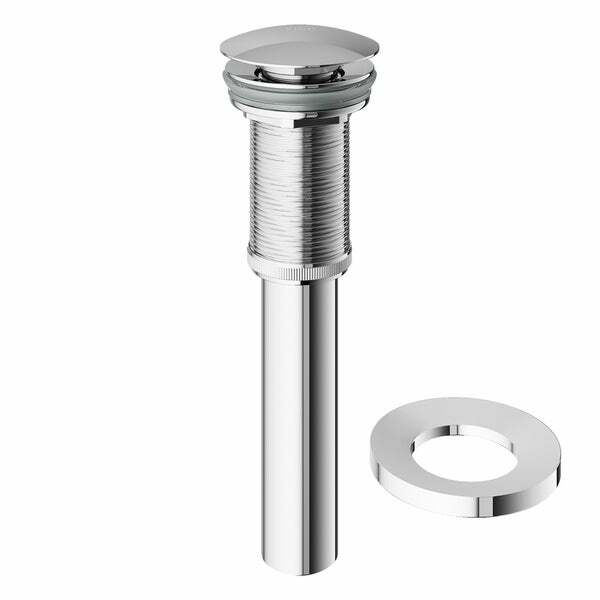 Update your bathroom sink with a VIGO Pop-up Drain Assembly and Mounting Ring. This advanced pop-up is built specifically for VIGO's vessel sinks and comes with a mounting ring that lifts the vessel sink off the countertop for easier cleaning. Made of solid brass construction with a chrome finish, this pop-up drain is built to last. Thought I could use a local ***** vessel sink product instead of this one. As it turned out, I was sent the wrong one by the supplier and decided just to order this one. Wow was I glad we did, as was our contractor. Not only does it work great, was the correct exact size, but the mounting ring makes cleaning underneath the bowl a whole lot easier. So glad we bought it to go with the overstock vessel sink! I bought two (2) of the Vigo Pop-Up drains two (2) years ago. I recently discovered that the metal flange (located inside the sink) on both units was disintegrating. Obviously, this should not occur after just two (2) years of normal use. I contacted Overstock Customer Service to see if there was a warranty on the items, however they referred me to Vigo Industries. I reviewed their limited warranty, which was for one (1) year, so I did not waste their time by contacting them. I like that it came with the mounting ring and that it is made by the same company that made my vessel sink so I felt good about buying it, too, from Overstock. Wanted to make sure I had the right accessories for my sink and am pleased the drain and ring came together so I know what I needed for the sink set up. Absolutely pleased with this pop up drain and mounting ring in chrome! Lovely shiny finish. Have not installed it yet, but it is very heavy weight metal and appears to be very serviceable. Will try to report how it works after it is installed. Don't think you will be disappointed in this purchase. Product looks great, however I must return it. Wrong ( chrome) finish. I have since reordered the bronze faucet with the pop up drain to match the Vigo glass vessel. While this drain plug was a good value and works fine once installed, it wasn't without problems. There is no overflow drain hole, which our vessel sink requires in order to avoid future problems with odor building up from retained waste water. Also, our granite countertop had to have a larger hole cut into it, or else the drain pipe would not have been long enough to connect things together. The top of the drain plug is quite large, but I guess the vessel sink drain hole requires this--just be aware it looks much larger than you are probably used to seeing at the bottom of your sink. Only for sinks without an overflow. We bought these for one style of sink, then an issue with paypal caused that sink order to be cancelled. The customer service agent at O.com helped us find another sink similar to the first. I didn't realize, though, that the new sinks had overflows. When the countertop was made, they attached the sinks. Then the plumber came to plumb the sinks. He put the faucets in then attached the drains, which is when we found the problem. He went ahead and put these in so we could use the sinks while we found the proper pop ups that are made for sinks with overflows. In the end, it cost us another $$$ to have the drains replaced. High quality pop-up-drain. Extremely impressed with the durability and construction by VIGO. I highly recommend this item. It was very easy to install. No issues with this drain. Installed easily and works to this day with no issues. Purchased a few years back and would recommend to anyone needing to replace sinks that needs a new drain. Finesse and sophistication! Worth every cent!! Beautiful and well made. Too bad most of it under sink. "Will this fit Vigo sink drain item number 15094466 ? And will this mount it to the counter top ?" The VG07000CH is the correct model for what you are looking to do. "Hi will this item fit/ suitable for item number 16785852 please?" "how long is the flange portion?" Hello Betty, thank you for your inquiry. Unfortunately, the information you have requested is currently unavailable. You will receive an email notification once an answer is posted. Have a great day. We are installing a new vessel sink we received for X-mas. We checked the box and there was no drain plug and ring. "does this fit VIGO Mediterranean Seashell Glass Vessel Bathroom Sink Item #: 13985251"
Hello Blue, you will need a larger pop up drain for that particular sink, I would suggest item number 14546396. Thanks for shopping with us! "What is the PIPE diameter??" Thank you for your question. The smooth pipe at the bottom of the drain assembly is 1 1/4" and the threaded pipe just above the smooth pipe is 1 5/8".